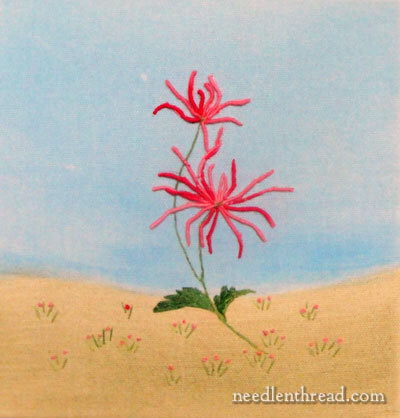 It’s so much fun to see what’s going on in the embroidery lives of readers here on Needle ‘n Thread! Today, let’s look at an example of a reader’s embroidery, one that I think is a really fun idea that opens up all kinds of possibilities for household decor! Caroline Thomas recently sent me photos of a collection of work she’s been doing for her daughter’s teacher. Already, we’re off to a good start! Hurray for parents who do nice things for teachers! The collection is made up of 18 canvases – not needlepoint canvas, mind you, but art canvases – that she painted and to which she then added touches of hand embroidery. 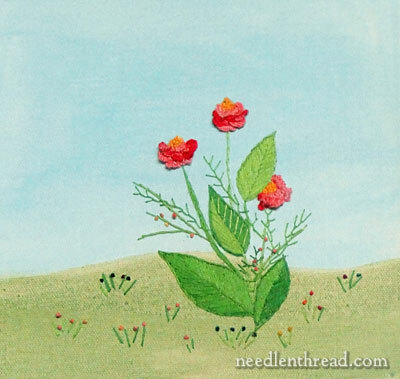 Caroline is just learning embroidery, so she treated the collection like a sampler, using all kinds of different stitches for the embroidered elements. I don’t know if these are destined for a classroom, but I think they are. A great way to add a cheery, sunny touch to the learning environment! 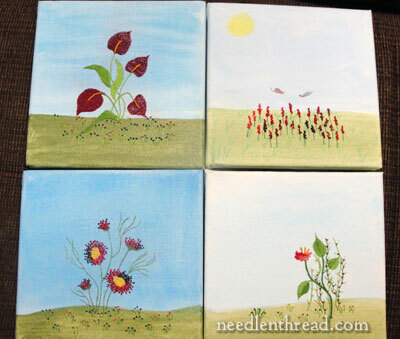 All the canvases are the same size, though I’m not sure what size. I’d guess somewhere 8 to 10 inches square. I like the idea of a set of same-sized scenes like these. They’re perfect as “tiles” of color and texture. Caroline said that she used regular DMC stranded cotton floss for all the embroidery. 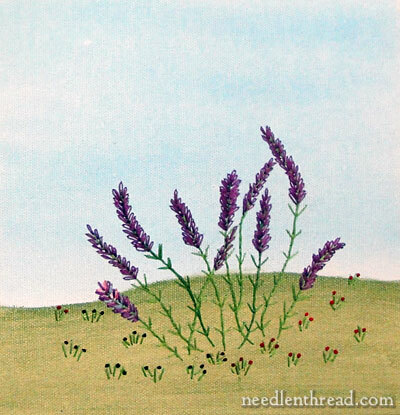 I love these wispy lavender looking flowers and those tiny red flowers scattered underneath! She used a whole slew of stitches throughout the canvases, including familiar stitches like stem stitch, couching, long and short stitch, French knots, fishbone stitch, bullion knots, detached buttonhole, and others. And this is another favorite! 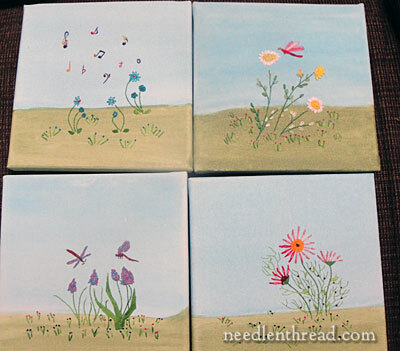 I can’t imagine that cast-on stitch flowers are easy on a painted canvas, but I think this little bunch came out great! Fun collection, isn’t it? If you’ve been musing about how to decorate a room in your house – like a guest room or a kid’s room or even the living room – maybe this will give you some ideas! Thanks for sending the photos, Caroline, and congratulations on completing the collection! I bet your daughter’s teacher is thrilled silly! 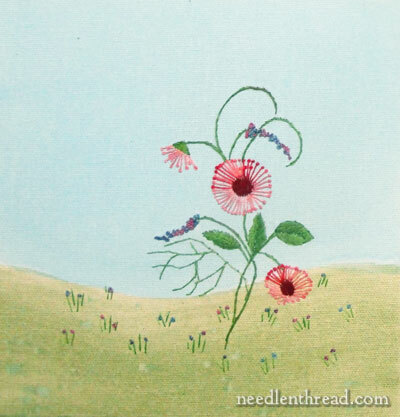 You can find lots of other embroidery projects from readers here on Needle ‘n Thread – they’re always fun to browse through for a shot of inspiration! If you’ve recently finished something you’d like featured on Needle ‘n Thread, feel free to drop me a line and tell me about it. If you haven’t signed up yet for this week’s give-away of a whole collection of coton a broder in colors, don’t forget to do that before Monday! It’s a wonderful give-away, thanks to Hedgehog Handworks, where they’re now stocking the whole color line of coton a broder 25. June 23, 2010 Hand Embroider a Tree! These are lovely – and very different. The teacher must be absolutely thrilled! Beautiful pictures I love the combination of painting and needlework together it looks so interesting my favourite is the flowers and musical notes beautiful I can’t believe that you are new to embroidery lovely. I expect the teacher was delighted. WOW, I can’t imagine how sore her poor fingers were after that! They are beautiful!!! Are cast-on stitch flowers easy on *anything*? ?=) I love the look of them, but BOY are they tricky! Perhaps I need more practice. These are beautiful!! Really lovely work, Caroline!! 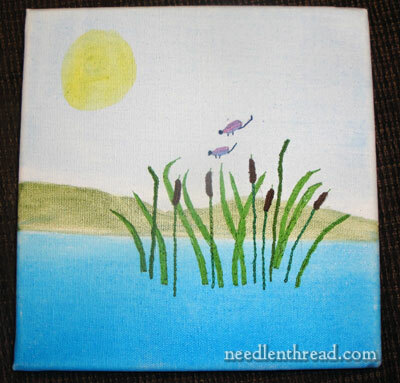 I’m wondering what kind of paint you used and did you have any trouble with it cracking as you embroidered. It’s such a wonderful idea. The recipient of these must feel so honored! What a neat idea! The designs, colors and variety of stitches is really striking. Well done. Beaut. I’ve given it lots of thought too re free design type of thing with my artwork, some different textural relief, even painting over parts of embroidery filling areas. Bravo to Caroline though, for the doing. Good on you, and thanks Mary for the post. 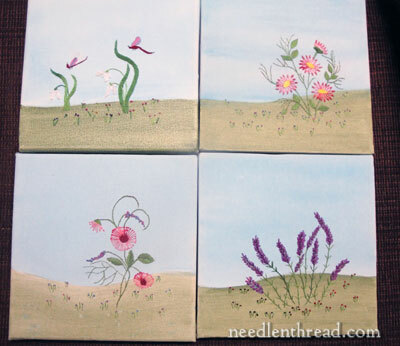 The flowers alone are gorgeous, but the handpainted backgrounds add so much to each piece. This is so inspiring, thanks for sharing! Thanks Caroline & Mary! Glad to see I’m not the only person experimenting with artist’s canvas. Did Caroline mention what sort of paint she used on her canvas? Her colors are soft & matte. I used regular acrylics from Pat Catan’s & they turned out shinier than I would prefer so I’d like to correct that aspect for the next time–if there is one! 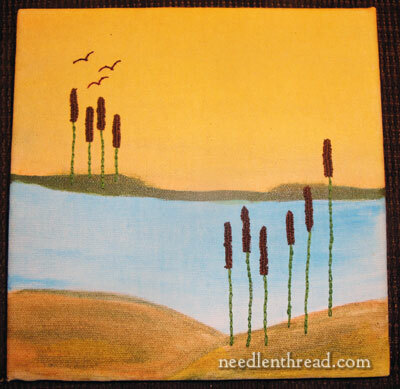 My project used Wildflowers thread & #3 crewel needle. I don’t usually use a thimble but would suggest it for those who do as otherwise there will be some injuries! The edges cannot be stitched because of the wood frame so I covered mine with fabric & stumpwork leaves. It’s an idea worth pursuing for a mixed media type result. Thanks for the update Mary! I used artist’s acrylics (tube) & will try regular craft acrylics the next time. Misplaced holes were not a problem for me, probably because of the thicker paint. If I can get a decent photo, I’ll post it. 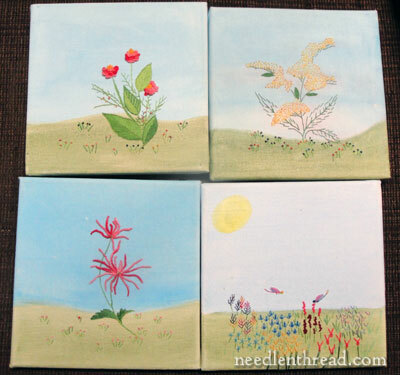 These are lovely – I can imagine stitching anything into painted artist’s canvas must be challenging to say the least, and to do that when you’re just learning to embroider – impressive! Thanks for sharing them – very inspirational. Wow..It is a wonderful idea. I have started to make one for my living room. Although I have a question, what have you done to cover the back of the art canvas? I can see the stitches from behind. Previous Previous post: Hungarian Redwork Runner: Some Progress, but Not Much!